Computers with MacOS installed should automatically select the correct display profile (or "color space") for an attached display. However, sometimes this automatic coordination does not work properly, resulting in an image that may appear as incorrect colors, missing colors, or dramatically bold colors. 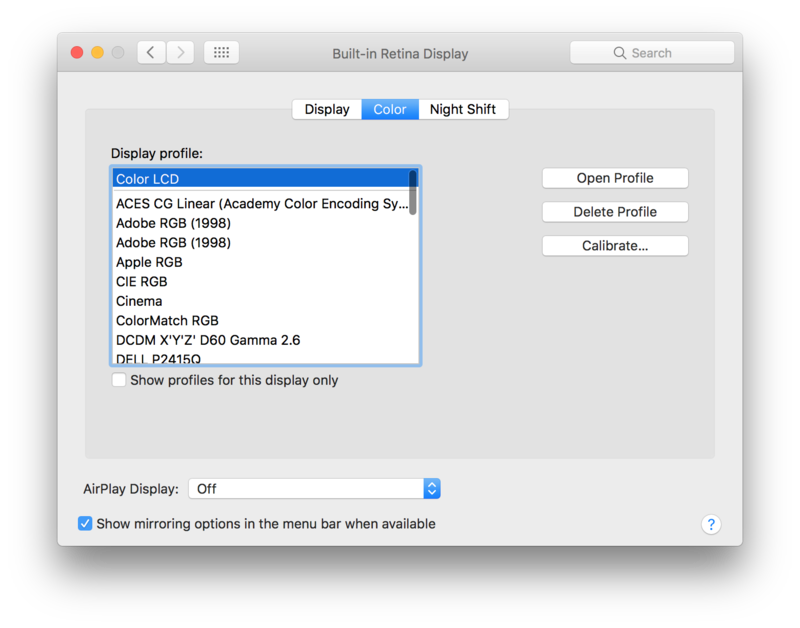 To change the color space that MacOS is using for a particular display, open the System Preferences app (Apple Menu -> System Preferences), then choose "Displays." If you are on a laptop connected to an external display (monitor, projector, etc. ), you will see two windows, one for each connected display (including the built-in display if on a laptop). Select the "Color" tab in the window for the display you would like to change color space for. At the top of the window, under "Display profile:" you should see one or more names of profiles above a solid ruled line. These are the profiles that the selected display prefers to use. Select one of those and see if the output on the display matches your expectations. If not, select one of the other available profiles better matches your preferences. Note that this setting should be saved per display, so it should not affect the color profile for other displays you might connect to (in your office, classroom, or at home). However, if you connect in multiple rooms with the same model of display (i.e., a Panasonic PT-FW430 projector), the selected color profile will carry over to that display as well. If you have any issues with colors on a display in a classroom or conference room, please fill out a support ticket for Campus Media Services. Check out this knowledge base article I found in the Wichita State University knowledge base. https://wichita.teamdynamix.com/TDClient/KB/ArticleDet?ID=63568 Change the color profile on MacOS Selecting the right display profile for an external display (monitor, projector, etc.) can often resolve issues regarding incorrect color display with MacOS.